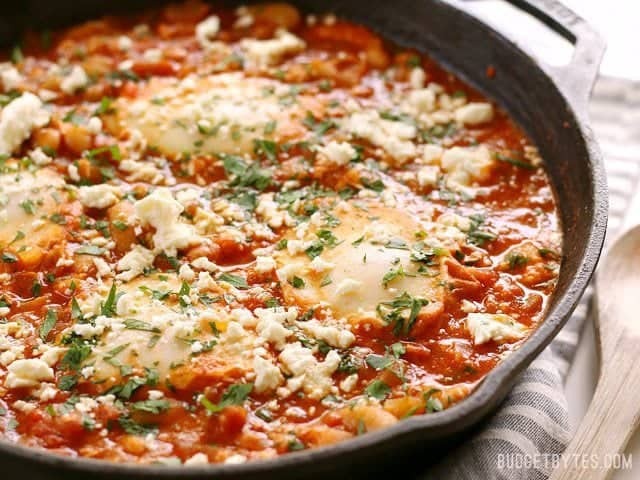 If there was ever a recipe worthy of “breakfast for dinner” it would be shakshuka. 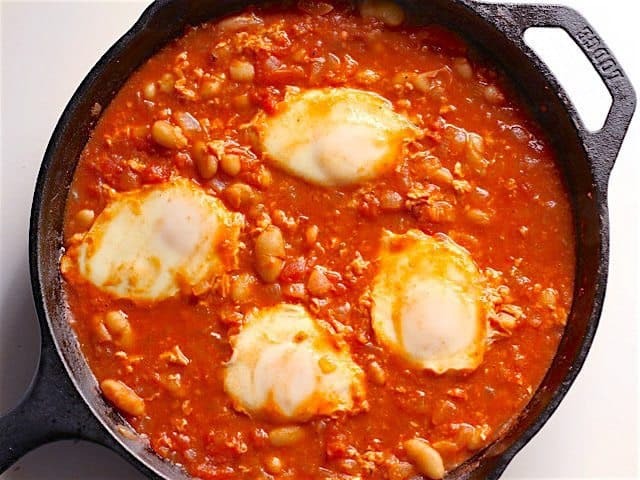 This delicious dish of eggs poached in a rich tomato sauce is usually full of fresh peppers and rather spicy, but I decided to take mine in a slightly different direction. I added cannellini beans to bulk it up a bit, plus a hefty dose of smoked paprika to give it a deep, fire-roasted flavor. OMG. 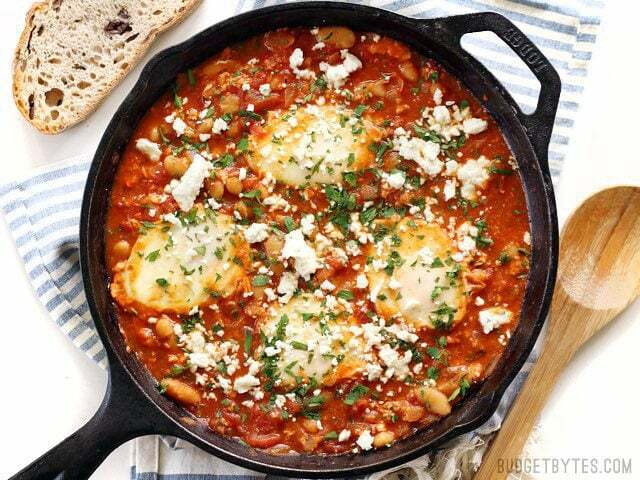 Brinner never tasted as good as this Smoky White Bean Shakshuka. 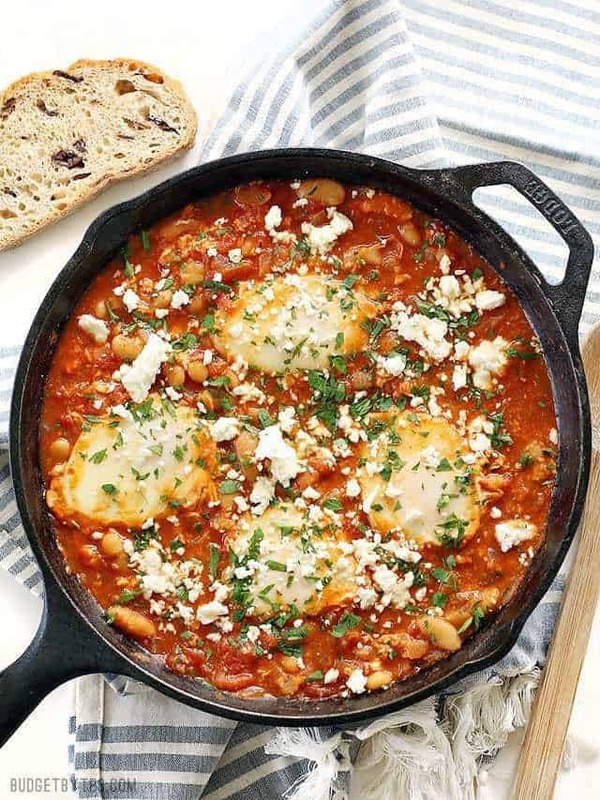 Despite the added beans, you’ll probably want to serve this with some crusty bread or homemade naan to sop of the delicious sauce. No bread? No problem. Spoon the saucy mix over a bowl of grits or rice (like we do here in the south). Just don’t let one drop of that sauce go to waste, promise? K.
Mince the garlic and finely dice the onion. Cook both in a large deep skillet with olive oil over medium heat until the onions are soft and transparent (about 5 minutes). 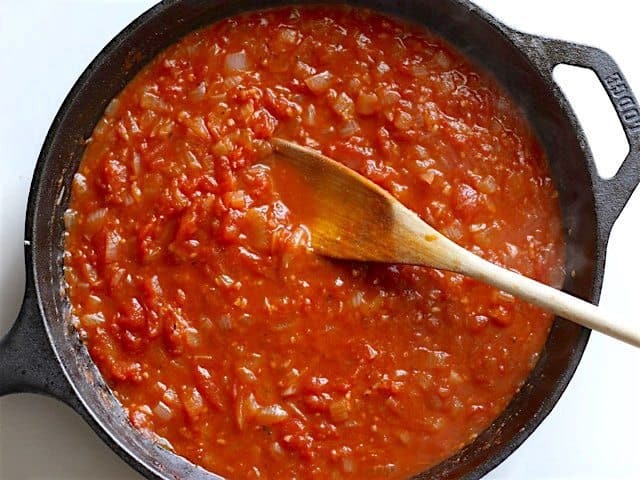 Add the canned tomatoes and their juices, crushing the tomatoes with your hands as you add them to the skillet. Add the smoked paprika, cumin, oregano, red pepper flakes, and some freshly cracked pepper as well. Stir to combine. Allow the sauce to come to a simmer. Let the sauce simmer, stirring occasionally, for 5-7 minutes, or until it has thickened slightly. Add 1/4 tsp salt, then taste the sauce and adjust the salt or other spices to your liking. 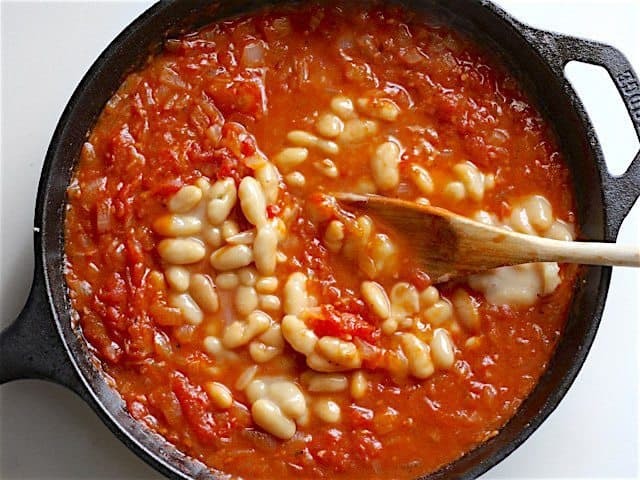 Drain the white beans, add them to the skillet, then stir to combine. Allow the skillet to return to a simmer. Simmer for 2-3 minutes more. 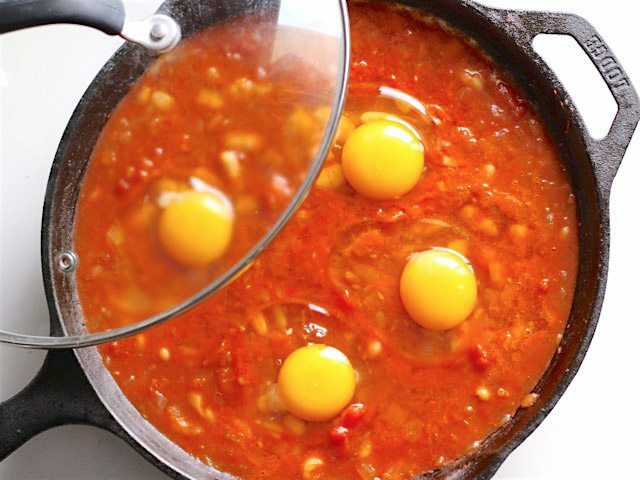 Crack four eggs into the skillet, then place a lid on top and let them simmer for 5 minutes, or until the whites are set but the yolks are still soft. 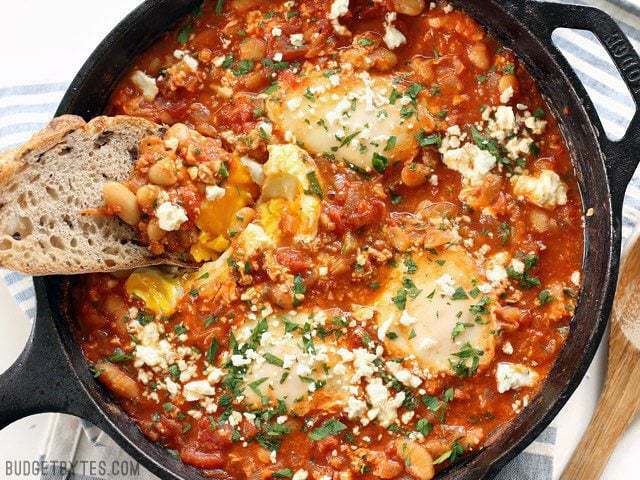 Top the skillet with the crumbled feta and chopped parsley. Start by mincing 4 cloves garlic and finely dicing one yellow onion. If you want to, you can also dice a jalapeño and toss it in there as well. 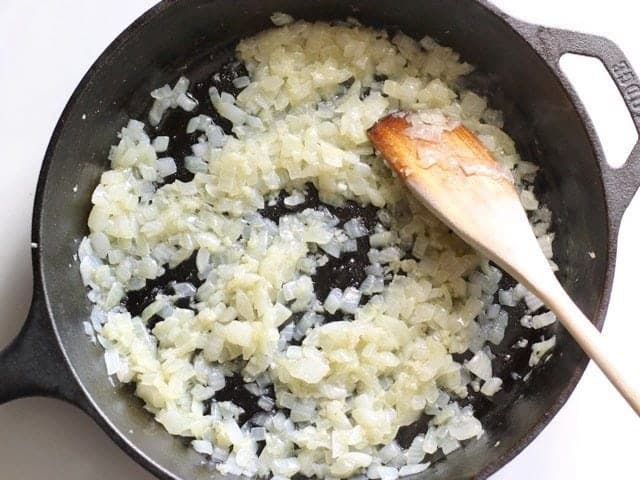 Add the garlic and onion to a large skillet along with 2 Tbsp olive oil and cook over medium heat until the onions are soft and transparent (about 5 minutes). Add a 28oz. can of whole tomatoes (with the juices) to the skillet. 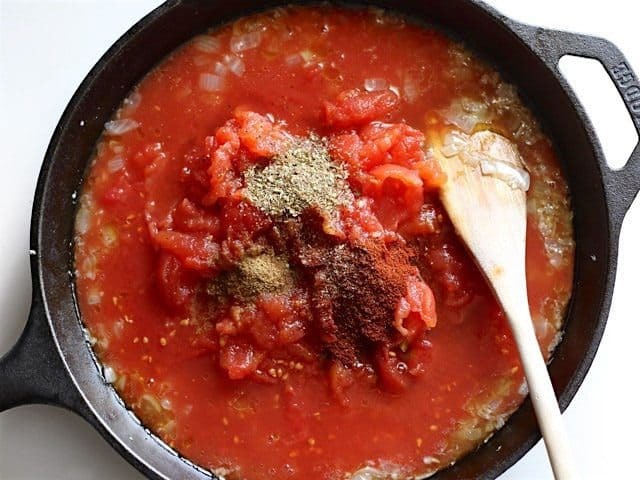 Use your hands to crush the tomatoes as you add them to the skillet. 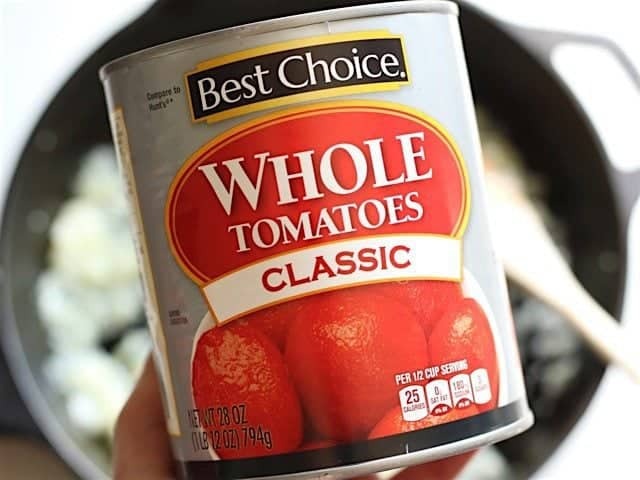 Word on the street is that the best tomatoes are reserved for the “whole” canned variety, while lesser tomatoes are used for “diced” or “crushed”. I’m not sure if that’s true, I just liked the organic shapes of the hand crushed tomatoes rather than perfectly diced bits. You can use diced or crushed if that’s easier for you. Along with the crushed tomatoes, add 1/2 Tbsp smoked paprika, 1 tsp cumin, 1/2 tsp oregano, 1/8 tsp red pepper flakes, and some freshly cracked pepper (about 10 cranks of a pepper mill). Stir to combine. Let the sauce come to a simmer over medium heat. Let it simmer for 5-7 minutes, or until it’s slightly thicker and saucy. It starts out more watery, but you want it closer to the thickness of V8 juice (if you’re familiar with that!). Now that the sauce has thickened, it’s time to add the salt. Stir in 1/4 tsp salt, then taste and adjust to your liking. You can also add more smoked paprika or red pepper flakes, if you like an extra punch. Drain a 15oz. 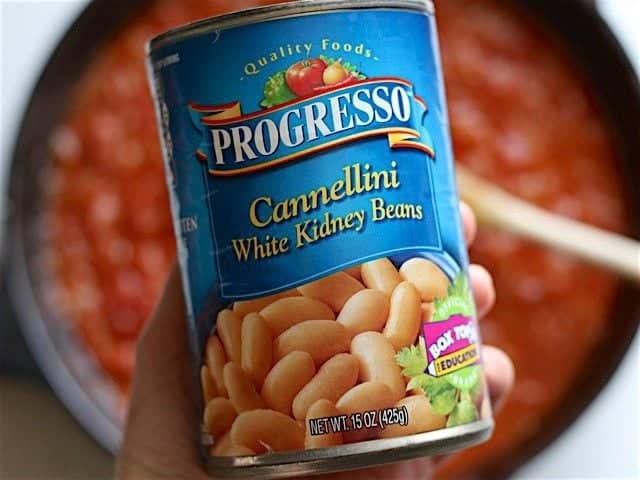 can of cannellini beans and add them to the sauce. Cannellini is the best white bean to use for this recipe because they are larger, tend to be more firm, and don’t break down as easily as navy or great northern beans. 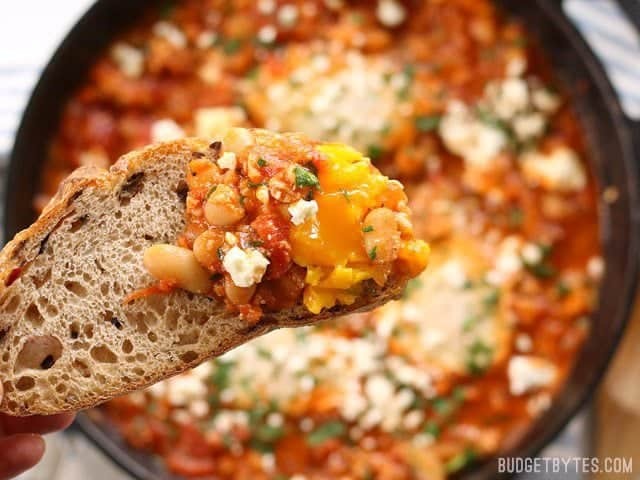 Garbanzo beans also work well in this. 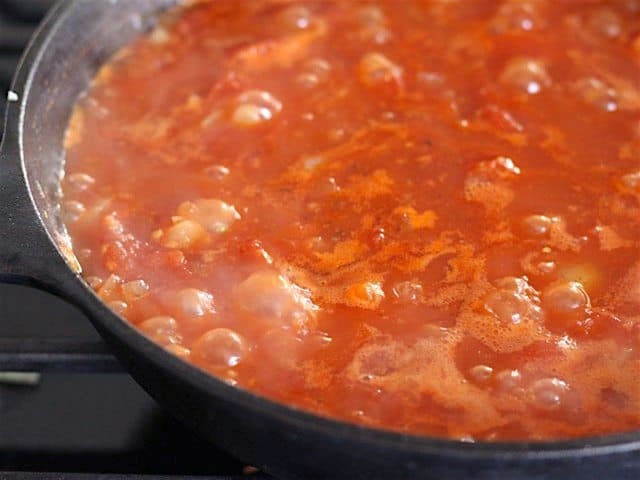 As it simmers, the sauce will settle some, so I always take a spoon and stir the sauce around the eggs to remix the beans and tomato pieces. Finally, top the eggs and sauce with 2oz. crumbled feta and a handful of chopped parsley. NOM. And seriously, every beautifully golden runny yolk deserves some bread for dipping, don’t you think? 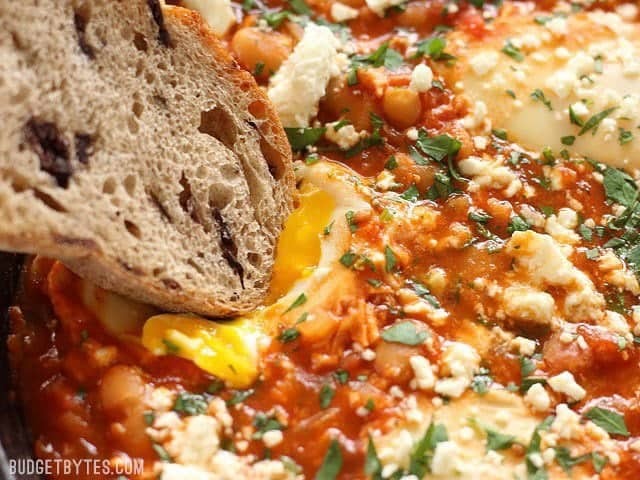 Smoky White Bean Shakshuka, it’s what’s for break… dinn… BRINNER! This was so good and filling! I used cilantro (I don’t love parsley) and added some spinach. It looks beautiful and tastes amazing! This will definitely become a new regular, thanks. Was delicious, will make again and again! Had some soaked white beans we just boiled up and I was looking for something new to do with… this fit the bill perfectly! So quick and easy. Added a splash of sukang maasim for a little more acidity and 1/2 c of home made stock for a little more depth. Yum! Soooo good! And i used cilantro instead of parsley (bought by mistake)…but oh my goodness; it was delicious!! Would this work well as a meal prep/frozen? Excluding the eggs, thinking of making those the day of! What kind of bread do you use? I want to look for crusty bread but don’t know the name. I have made this recipe many times, and am always thrilled by how easily it comes together and how delicious it is! I usually end up adding a bit more paprika, since I can’t get enough of the smoky flavor it gives. This is one of my weeknight favs! I am a WW and this recipie gives me a virtually free dinner! I use this one especially when I’m pushing towards my weight loss goal. My home grown tomatoes really makes this sing. Thanks Beth for another winner! This recipe is fire! Winner! This was yummy and so easy. My nonvegetarian husband was very skeptical but we both loved it. I put this over brown rice. mine came out really chunky, and not very saucy when i made it….it still tasted amazing! but, any recommendations for getting it a little more saucy, and not so thick/chunky? What were the chunks of? Onion or tomato?